From the early nineteenth century onward, iron and steel production in smelting plants was an essential part of German industrialization, supplying the necessary materials for railway construction and providing employment for the expanding population. With its harmful emissions and effluents, however, the iron and steel industry was also responsible for considerable pollution. Working conditions inside the plants were tough as well. 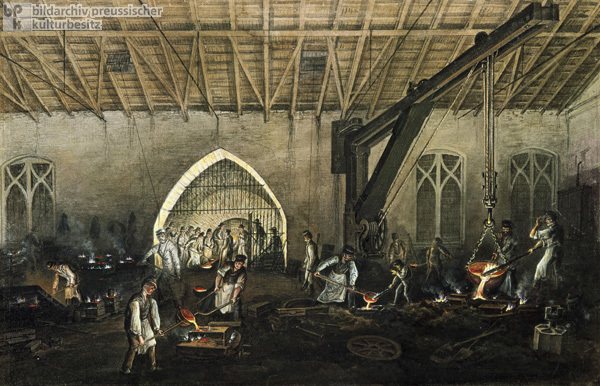 This depiction of casting at the Aloishütte smelting works shows laborers toiling amidst oppressive fumes, molten ore, and dangerous machinery – without any sort of protection. Note, for example, the manner in which they pour liquid iron into the casting ladles. At the end of the eighteenth century, Prince Alois of Liechtenstein (1759-1805) had founded the Moravian town of Alojzov, designating it as the site of the Aloishütte iron smeltery. Colored lithograph by Ernst Wilhelm Knippel (1811-1900), 1856.